In a healthy person the immune system is perfectly balanced to provide protection against invading harmful pathogens or malignant cells, while maintaining a state of unresponsiveness (‘tolerance’) to our own body tissues and to the harmless substances we eat or inhale. However, in major diseases such as infections (e.g. AIDS), inflammation (e.g. arthritis) and cancer (e.g. skin cancer, leukaemia), a pathological disbalance in this immune homeostasis occurs. The latest developments in basic and clinical research have suggested that myeloid regulatory cells contribute to this pathological immune disbalance. Myeloid regulatory cells are a specialised subset of white blood cells, which include granulocytes, dendritic cells, macrophages and myeloid-derived suppressor cells, and acquire immunoregulatory and/or immunosuppressive activity as a consequence of the disease of the host. Unfortunately, the dysfunction of these cells is still poorly understood. The reason for this is that, worldwide, myeloid regulatory cells have been researched using vastly different methods and markers. 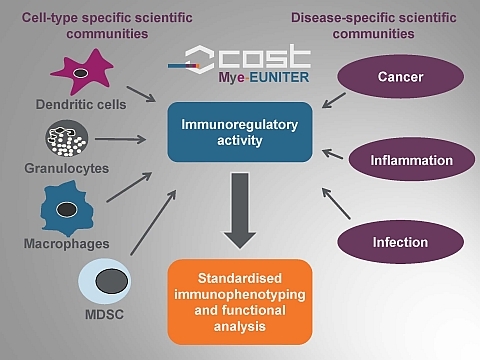 The new COST Action Mye-EUNITER, short for “European Network of Investigators Triggering Exploratory Research on Myeloid Regulatory Cells,” aims to establish technical standards for the characterisation and analysis of these cells. “These standardised and validated tools will aid the development of cellular biomarkers of disease and guide the design of novel therapies to manipulate the functions of these cells,” hopes Sven Brandau, an immunologist at the University of Duisburg-Essen and Vice-Chair of BIOME Graduate School who is spearheading the Action. Mye-EUNITER includes member scientists from Austria, Belgium, Croatia, France, Germany, Greece, Hungary, Ireland, Israel, Italy, Netherlands, Poland, Portugal, Romania, Spain, Sweden, Switzerland and the United Kingdom. The network also has collaborative partners in USA. The Mye-EUNITER concept stems from an IRUN biomedical initiative which held meetings in Duisburg-Essen (2011), Münster (2012) and Nijmegen (2013).